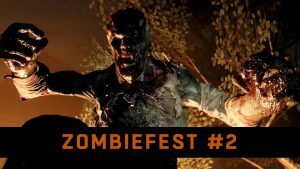 On December 23rd, 12 PM PDT to December 26th, 11:30 PM PDT, players of the hit zombie game “Dying Light: The Following” can take part in the second “Be The Zombie” event, known as “Zombiefest #2”. Players can become zombie enemies and invade other player’s games. The twist to this event is that it will be, as the developers put it “Back to basics”. Which mean that there will be no spits, no tackles, and no sensing other players. Rather they will only have a UV Flashlight and Pounce. There will be a global score counter that will tallies up the kills and decide which faction would be the ” real predators”: the “Survivors” or the “Hunters”. Anyone who participates in this event will get a “GOLD-TIER WEAPON” and enjoy a MODIFIED RANK TITLE reflecting the final result. Take part in the event to receive a GOLD-TIER WEAPON DOCKET (usable in Campaign Mode). All players will receive NEW RANKS that will reflect the outcome of the event (active for 3 weeks).